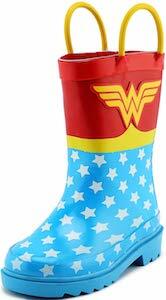 Now the rain can come because there are these Kids Wonder Woman Rain Boots. Now your little superhero can have all the fun in the puddles and rain all thanks to these amazing looking rain boots. The Wonder Woman boots come in many toddler and kids sizes so that many kids can enjoy them. The bottom part of the boots are light blue with white stars and the top part is red with the famous Wonder Woman logo and in between the blue and red you find a yellow part and all looks a lot like the Wonder Woman outfit. And these kids rain boots also have yellow loops to make it easy for the kids to put them on.